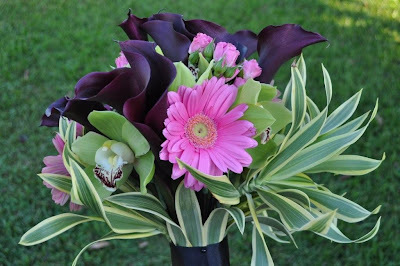 The great Maui morning inspired this wonderful bouquet for a lucky Bride over at A Paradise Dream Wedding. The liliies, gerbers and Song of India complimented the cymbidian orchids like they had all met before. The black ribbon below held all that color up as if it had the power of steel. Quite a presentation from Dellables.